WEll for the last two weeks I've had heartburn like crazy...worse than any other pregnancy yet. 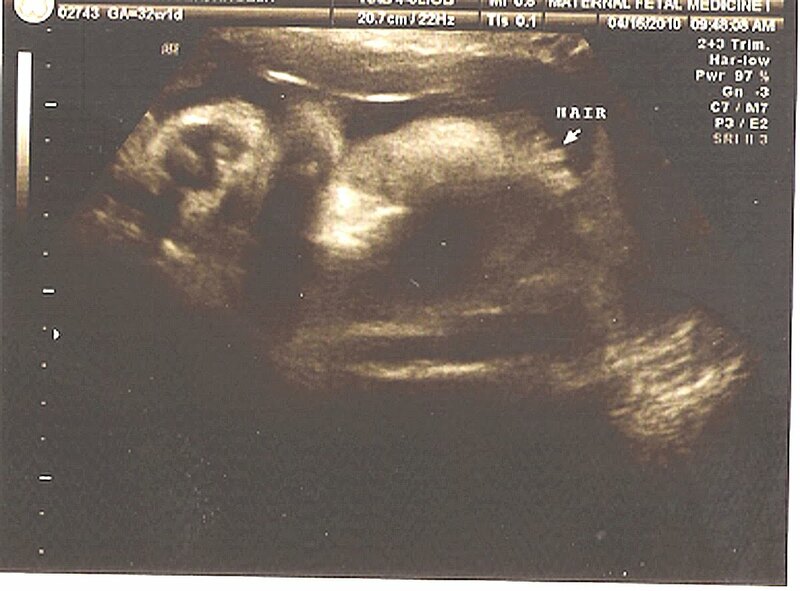 Today we found out why, they always say if you have bad heartburn than the baby will have lots of hair. Well, I think this proves it. By the way the baby is catching up big time, it went from being in the 8th percentile to the 35 percentile, which is really good. They estimated it to be about 4 lbs 2 oz. 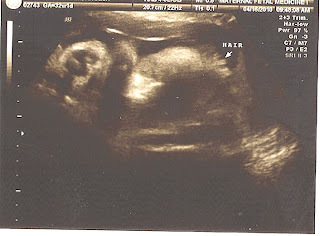 We go back in two more weeks for hopefully the last ultrasound. Today Ty decided to take his training wheels off of his bike and after only two tries with grandma hanging on he can ride a two wheeler. There's nothing he does that doesn't amaze me. Wyatt had to get his motorcycle out too when we got home. Yeah for spring! Wyatt took a nosedive down the outside deck stairs at Grandma Joans Sunday. I think this was Wyatt's worst fall yet, I was close to taking him in to the ER. Now he looks like he has purple eyeshadow on and a a green forhead.